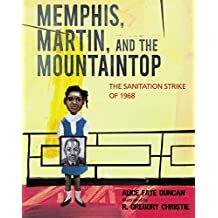 Memphis, Martin, and the Mountaintop: The Sanitation Strike of 1968, written by Alice Faye Duncan and illustrated by R. Gregory Christie, is not the story of a single man – it is the story of a collective struggle. Duncan makes this struggle real and accessible to even the youngest of readers by unapologetically representing racism and the abuses of power that are a central logic and practice of capitalism. Christie’s atmospheric illustrations envelope each of Duncan’s interconnected vignettes helping express the shifting tone of the emotionally challenging story that puts American history on display in all its complexity. Memphis, Martin, and the Mountaintop is told in the first-person through the point-of-view of a Memphis teacher who was the daughter of a sanitation worker during the 1968 strike. Black sanitation workers were fed up with poor wages that kept them on welfare as well as with unsafe equipment, which led to the deaths of two black sanitation workers, Echol Cole and Robert Walker. Workers formed a labor union to demand fair pay and dignity, but Memphis’s mayor, Henry Loeb, refused to recognize it. On February 12, 1968 “1,300 men deserted their garbage barrels.” The strike would last 65 days. In March of 1968, Dr. Martin Luther King Jr. infused the strikers with a new sense of hope by going to Memphis and planning a march. The peaceful march was interrupted by rioters and violence was exasperated by police force. King left the city with promises to return. He kept his word and was back in Memphis within a week. In “Lorraine,” the most poignant vignette in the book, Duncan names her narrator, Lorraine Jackson. Then, Duncan breathlessly and unapologetically paints a painful picture of Dr. Martin Luther King Jr.’s last hours in The Lorraine Motel. She describes the details of King’s assassin’s rifle pointed at his hotel room, and the riffle’s bullet as it “pierced the dreamer’s neck.” Duncan’s unflinching description of King’s violent death refuses to spare young readers the real cost of social transformation, a rare show of respect for picture books’ target audience, and one I appreciate greatly. Duncan moves her reader through the immediate aftermath of King’s assassination as Coretta Scott King worked to continue her partner’s pledge to support the sanitation strike, which ended April 16, 1968 as a result of federal intervention. Duncan gifts us the story of families and communities doing the hard work of loving, living, and laboring to build a more just world. This is a biography of Dr. Martin Luther King Jr. told through the story of one community he helped change, but the community itself is an integral part of its telling. Duncan commits to communicating this hard history and does so beautifully and brilliantly. I cannot recommend this book highly enough for classroom and personal libraries.